During embryonic development, groups of up to thousands of cells organize themselves to give rise to the tissues and organs that form the final organism. These processes rely not only on the tight spatiotemporal control of cell differentiation but also on the three-dimensional organization these cells acquire to generate the particular form of each organ. Cell-to-cell communication is a key event for both these processes to occur in a precise manner during normal development, and its misregulation is one of the most prevalent causes of diseases such as cancer, congenital malformations and neurological disorders. In the regulation of differentiation and growth several signalling molecules function as messengers between cells. In some cases long-distance cell-cell signal communication is essential, and some of these signal molecules acts as morphogens; acting at a distance and in a concentration-dependent manner controlling the differential activation of target genes. The graded distribution of morphogens and the ability of the receptor cells to respond specifically to different ligand concentrations have to be tightly regulated processes. Long-established models for the free diffusion of signalling molecules have recently been challenged by increasing evidence for specialized filopodia (also called cytonemes) facilitate concentration and spatial restriction of a signal. Cytonemes are known to play roles in several signalling pathways but little is known about their formation and directional establishment. Figure 1. Cytoneme-mediated Hh transport in Drosophila wing imaginal disk and histoblast epithelia. (A) Drawing of an adult Drosophila with various colors highlighting different body structures. (B) Drawing of a Drosophila larva showing several thoracic imaginal discs and abdominal histoblast nests, with their A and P compartments marked in white and red, respectively. Purple boxes outline the wing pouch of the wing disk and the dorsal histoblast nests of two segments. (C) The rectangles depict Hh-expressing (red) and Hh-signaling (blue) regions in the wing disk epithelium (left) and in two abdominal segments after the histoblast nest fusion (right). (D) Drawing of cells in the vicinity of the A/P compartment border of either disk or abdominal epithelia that express (red) or respond to (blue) Hh. Cytonemes from Hh producing cells (red) and from receiving cells (blue) vary in length and their dynamics are proposed to shape the Hh concentration gradient. (E) Enlargement of (D) to show exovesicles that contain Hh and move along cytonemes. To study the role of cytonemes in cell-cell signalling we investigated Hh gradient formation. Hh has a central role in development in both vertebrates and invertebrates. Hh was later implicated in other processes, including adult stem cell maintenance, cell migration, axon guidance and cancer, in a wide range of organisms. 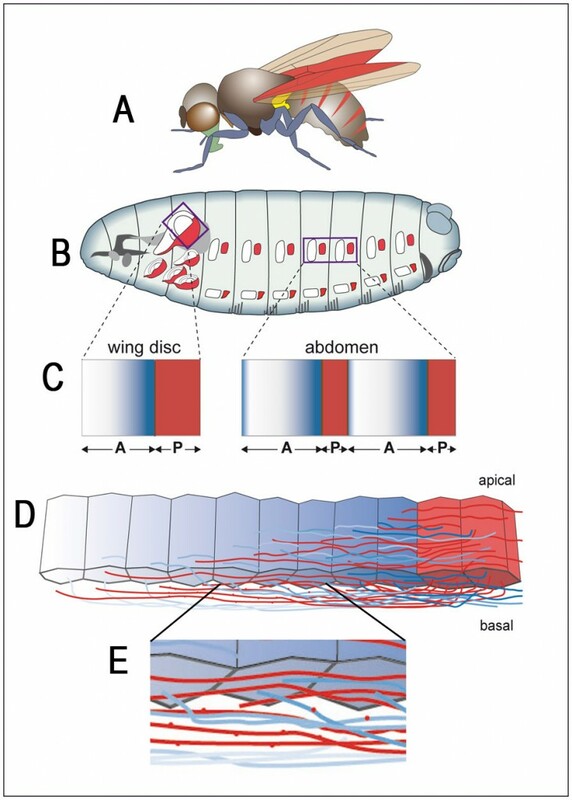 In our studies we use two experimental paradigms in Drosophila, the wing disc and the abdominal epidermis (Fig.1 A-D). The wing imaginal disc and each segment of the abdominal epidermis comprise two cell populations with different adhesion affinities dividing the field into a posterior (P) and an anterior (A) compartment. The P compartment cells produce Hh, which moves across the A/P compartment border, decreasing in concentration as it spreads away from the border (Fig.1 A,-D). Hh is post-translational modified by the addition of cholesterol and palmitic acid, which confer a highly hydrophobic character on Hh. These modifications promote Hh association to lipid membranes but are essential for its restricted spreading raising the question of how its actual secretion and transfer are achieved. Our group has recently described that specialised filopodia or cytonemes are crucial for establishment for the Hedgehog (Hh) signalling in both the wing disc and the abdominal epidermis of Drosophila. Hh and several Hh signalling components localise to these actin-based protrusions. Thus the glypican Dally, the extracellular factor Shifted (Shf, also known as DmWif), and the Immunoglobulin- like (Ig-like and Fibronectin III (FNNIII)) domain-containing transmembrane proteins, Interference hedgehog (Ihog) and its related protein Brother of Ihog (Boi), are required for the stability, release and spread of Hh. In addition, we described that Dispatched (Disp, the glypican Dally-like (Dlp) and Ihog molecularly interact for the release of Hh. Furthermore, all these proteins molecularly interact and probably form a protein complex and part of thin filopodia-like structures or cytonemes, suggesting that the interaction between them is required for cytoneme-mediated Hh distribution during gradient formation. This Hh gradient is most likely formed through the basolateral part of the imaginal discs epithelia (Fig 2). Figure. 2 Model for Hh processing, trafficking, release, and reception in the Drosophila wing imaginal disc cells. 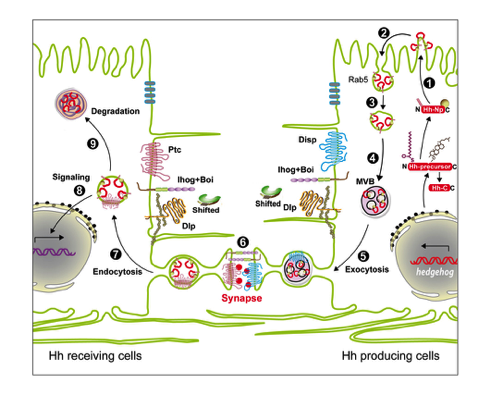 In these schematic representations of a Hh producing cell (right panel) and a Hh receiving cell (left panel), steps in Hh production, processing, movement and reception are depicted and enumerated. Hh transcription, processing, lipid modifications and apical externalization; internalization mediated by dynamin and Rab 5; recycling mediated by Rab 4, 8, 11 to form multivesicular bodies; release and transport cytoneme mediated. In this process several molecules has been identified; Disp, Dlp, Ihog, Boi and Shf. The reception is mediated by cytoneme and exovesicles. The reception takes place by cell-cell contact between receiving and presenting cells similar to a synaptic process. Ptc, Dlp, Ihog, Boi are required for reception. Endocytosis of the ligand and the receptor. Signal transduction and target activation. Lysosomal degradation. Although cytonemes have been mostly implicated in the communication between cells mediated by signalling morphogens, it is possible that cytonemes provide a general mechanism for inter-cellular communication across a wide range of morphogenetic processes. For example, during Dorsal Closure, a morphogenetic process of the Drosophila embryo akin to wound healing processes, interactions between three tissues, the epidermis, the amnioserosa (AS) and the yolk underneath the AS, have to be precisely coordinated to generate the final form of the larvae. 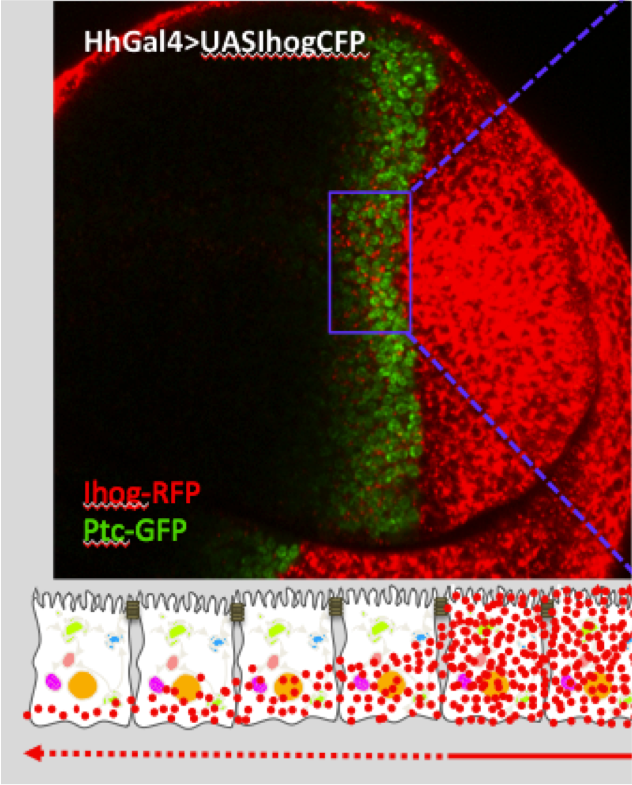 In close collaboration with the group of Nicole Gorfinkiel we have observed that during Dorsal Closure (DC), epithelial cells develop cytoneme-like structures. 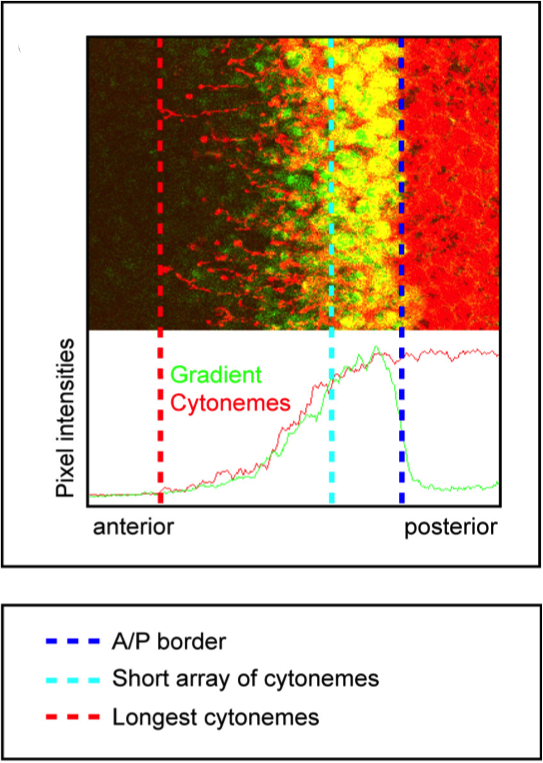 Using in vivo imaging, we show that cytonemes extend and retract dynamically and that Hh gradient establishment correlates with cytoneme formation in space and time. Interestingly, we observe punctate structures, some of which are associated with and move along cytonemes and probably released as exovesicles. Overall, our data support a model of Hh transport in vesicles along cytonemes, which act as routes for Hh movement in the extracellular matrix (ECM). We make use of three main experimental systems where to study cell-cell communication in vivo, the wing imaginal disc, the primordial of the abdominal segments and the embryonic epithelia during the process of dorsal closure. Fig 3. Model for processing and release Hh. A) In the producing cells Hh is translated, cleavage, lipid modified and externalized (red beads). B) Correlation (in length) between cytonemes (red) and Hh response gradient, measured by Ptc (green). Morphogenesis is the process whereby cells organize themselves during development to give rise to the characteristic 3D shapes of organs and organisms. During morphogenesis, cells exert and respond to forces in their surroundings to generate motion and deformations. These activities result from a deep interplay between mechanics and biochemistry and thus studying this interplay is crucial to understand how biological form is generated. To tackle this question, we study Dorsal Closure, a morphogenetic process that takes place during Drosophila development, that is a reference model system for other processes occurring in vertebrates such as neural tube closure and wound healing. Dorsal Closure leads to the closure of a gap that exists at the dorsal side of the embryo, which is transiently covered by an extra-embryonic tissue, the amnioserosa, which is continuous with the epidermis. During this process, the amnioserosa contracts and generates a force that pulls the two epidermal sheets, which finally seal at the dorsal midline. It is a process very amenable to live imaging and thus suitable to study the inherent dynamics of morphogenetic processes. In particular, we are interested in how the dynamic activity of the cytoskeleton connected to the adhesion systems gives rise to tissue contractile forces. We use genetics, cell biology, quantitative image analysis and biophysical modelling to understand these problems. Fig. 1: Stages of Dorsal Closure. Three main forces contribute to the process: the contraction of the amnioserosa (red arrows), the tension generated by a supracellular actin cable (green arrows), and the resistance of the epidermis (blue arrows).